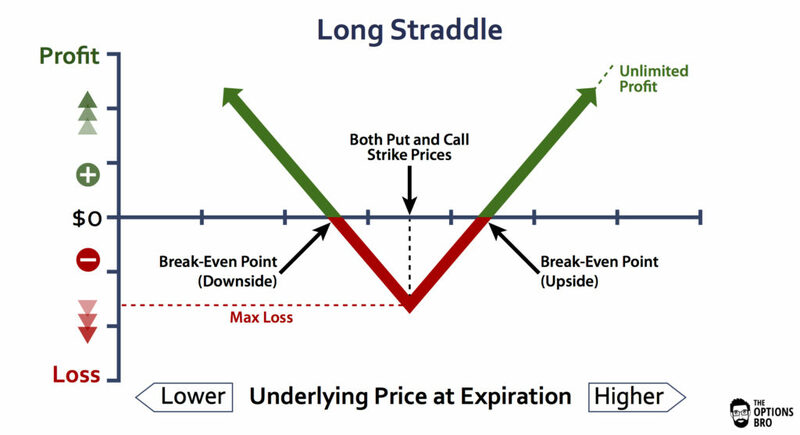 The long strangle option strategy is a neutral options trading strategy with limited risk that capitalizes on either up or down price movements as well as spikes in volatility. At its core, a long strangle is a long call and a long put combined on the same underlying security in the same expiration series. 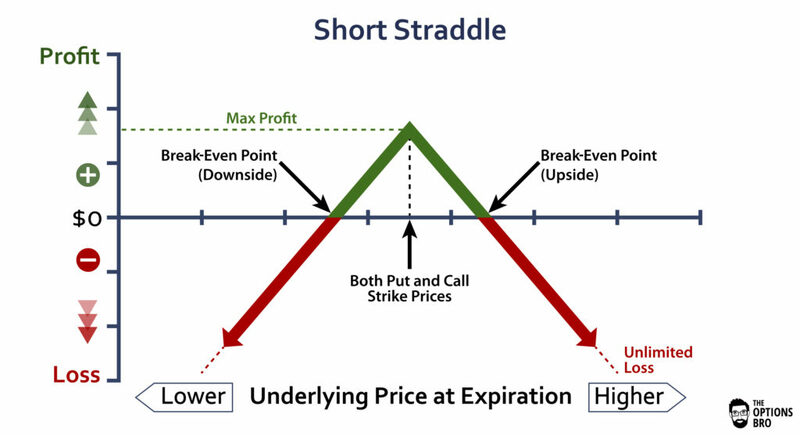 Unlike options trading strategies involving short options, the long strangles do not benefit from the passage of time. Therefore, precise timing is essential with this options strategy. Out of every online broker with 24/7 customer service in 2018, Ally Invest the has the lowest commissions to trade the long strangle strategy as well as the best free options trading software. Read the Ally Invest Review. Note: Long strangles are always traded out-of-the-money (OTM). If the long strangle is traded at-the-money, (ATM) it would be considered a long straddle. The net credit spent for this trade is $0.60 ($60), the cost of both long options positions. The best case scenario this example trade is for XYZ to fly to the moon, or crash and burn to the ground. If stock XYZ is anywhere between $55 and $45 at expiration, this trade would be a complete loser. Hence, dramatic moves are often needed for this strategy to be profitable. The maximum profit for a long strangle is always theoretically unlimited on the upside and capped at the underling going to zero on the downside. The max loss is limited to the total sum of the premium spent. In this case, $60. The long strangle option strategy is truly a neutral strategy, but there is an important distinction to make. It is not a neutral strategy in the sense that nothing needs to happen in the underlying asset; in fact, it’s the opposite. Although this is considered a neutral strategy, dramatic moves, either up or down, are needed for the long strangle to work. If the bottom falls out of the underlying asset, the position will make money. If the underlying asset crashes up, the position will also make money. On the contrary, other neutral options trading strategies don’t require any movement, i.e. the short strangle and iron condor. Therefore, the primary reason why traders buy strangles is to speculate that there will either be a dramatic increase in volatility or a dramatic move in the underlying asset, or both. Theta decay is very detrimental to a long strangle, because there are two long options positions. As expiration approaches, the long call and long put components of a long strangle are going to decrease in value solely due to time premium decay. It almost goes without saying that timing is critical for making money with long strangles. When Should I close out a Long Strangle? Because there are no short options in a long strangle, there is no “set” time to close out the position. As with all long options, if the value approaches zero, the best practice is to leave the position untouched, because there is always the chance that something will happen in the underlying and the position will become profitable; a long option position can never be worth below zero. Unless volatility dramatically expands, it’s very unusual for both the long put and the long call to be profitable in a short strangle at the same exact time. Consequently, this means if the long put becomes profitable, the long call will probably become unprofitable and vice versa. It is a bit of a delicate dance as to decide when to close out this strategy. Somewhat. There is an exercise risk for either the long call or the long put if either option is in-the-money at expiration. Note, however, that it is impossible for both options to be ITM at the same time. Although there is no assignment risk, because this is a long option position, there might be an exercise risk if there is not enough cash in the account to purchase the underlying asset (via the calls) or sell the underlying asset (via the puts). For stocks, for every 1 ITM call, 100 shares would be purchased, and for every ITM put, 100 shares would also be purchased. If you do not have enough free cash to purchase 100 shares of stock at the long options strike prices, this would be a minor predicament. Likely, your broker would reach out to you prior to expiration and kindly ask you to close the position if this were the case. Regardless, all expiration risk for long strangles can be easily avoided by closing out long ITM options positions prior to expiration if you don’t want to actually purchase or sell the stock. 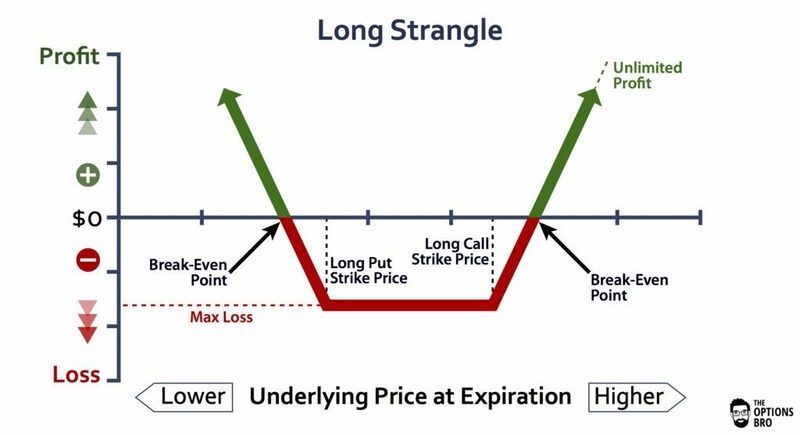 For the most part, traders use the long strangle option strategy when they anticipate large movements in an underlying asset, but they just don’t know whether the movements will be up or down. The long strangle is a popular strategy to deploy on individual stocks, often before earnings reports. Individual stocks seem to have more upside and downside risk than other assets, like indices. Not only will a long strangle benefit from significant up or down moves in the underlying, but it will also benefit from spikes in volatility. This is very important to be aware of upon order entry. Calls and puts become more expensive when volatility increases. Because a long strangle doesn’t involve any short options positions, the risk is limited and very conservative relative to the maximum potential profit. 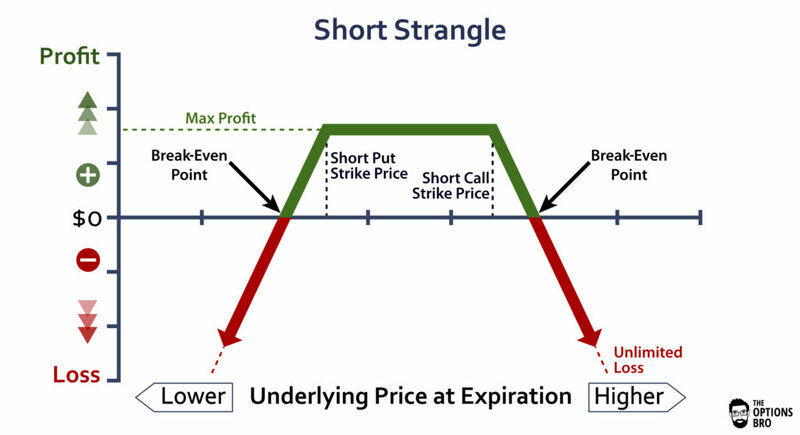 As far as trading options goes, strangles are one of the most conservative strategies due to the defined risk. Ally Invest is the cheapest broker to trade long strangles. Up to $3,500 cash bonus + commission free trades for new accounts.